As a long time user of Google reader, it saddens me to see the service closed. A ton of information will be lost. All the starred articles and feeds no longer available will disappear into the ether. I started looking into alternatives shortly after hearing about the intended closure. One reader I had heard a lot about in the past was NetNewsWire. One thing stuck out to me was the lack of sharing options. It has options to re-blog, save to Delicious, and send to Instapaper. There weren’t even options to share on Facebook or Twitter. I was particularly disappointed by no ability to save to Evernote. Evernote has greater persistence and searchability than other services. When adding an article to Evernote, the content syncs to all desktop clients. In the unlikely event Evernote shuts down, all the data in my Evernote maintains on my desktop. Not to worry, AppleScript to the rescue. 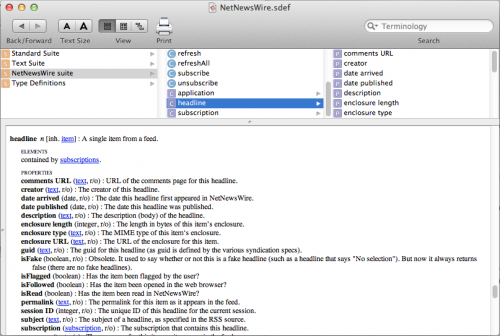 Both NetNewsWire and Evernote have AppleScript interfaces allowing automation of simple tasks. This script copies the current article in NetNewsWire into Evernote. Here is the code. Pretty straightforward. Also, Evernote must be open and logged in for the script to work. This entry was posted in Development and tagged applescript, code, evernote, netnewswire, sharing by Brian. Bookmark the permalink.